The Southeast Texas Junior Football League wrapped up a great season for 2017 and we are looking forward to an exciting 2018 Season! We are going into our 7th year as a member of the USA Football family and all the benefits it provides our League. All of our volunteers have national background checks and all coaches are certified in all aspects of youth football from concussion awareness to heat related injuries. 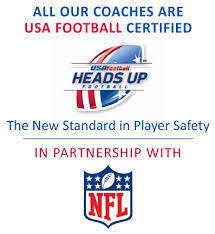 The STJFL also appoints 16 Player Safety Coaches (PSCs) who go through advanced training with USA Football to direct our safety initiatives throughout the league. We would like to thank all of our volunteers for the hundreds of hours they put in to make the league successful and safe as possible. As a result USA Football invited us to participate in the NFL Safety Conference at Orlando in January for the fifth consecutive year. We are also proud to offer the 7th season of STJFL Summer Track Program as well as the NFL Flag season as part of the NFL Play 60 program. Both off season programs are very popular with our members and have continued to grow since they were started. The STJFL is proud of the support the league has received from USA Football, Lamar University, NCA Cheer and the NFL over the years in being able to participate with their programs. We would also like to thank Academy Outdoors, Acadian Ambulance, and Buffalo Wild Wings as our longtime sponsors for all of their support they have offered the League. Copyright © 2013 Southeast Texas Junior Football & Cheer. All rights reserved. © 2001 - 2019 Southeast Texas Jr. Football and Cheer. All Rights Reserved.